Can Watford continue their run? Manchester United travel to Vicarage Road later today to play Watford, and their manager Jose Mourinho will want to get another three points on the board after the impressive 2-0 victory over Burnley at Turf Moor. However, Watford are no pushovers and are currently way above their Saturday opponents in the league table. They are unbeaten this season, having won four in four in the Premier League and the first round tie of the League Cup. Javi Gracia has done a fantastic job as manager, rallying his troops and getting behind them whenever they have looked down-and-out. If it were two Roberto Pereyra goals and an equal number of Jose Holebas assists in the first game, it was Troy Deeney who turned up in the second against Burnley. The Pereyra- Holebas duo shone again in their next game against Crystal Palace, but the icing on the cake came when they beat the formidable Tottenham Hotspur in Vicarage Road 2-1, again on the back of two assists from Holebas. They will be firm favourites when they host a troubled United on Saturday in a late kick-off, and all the credit has to be given to manager Gracia and his coaching staff for instilling this winning mentality in their players. 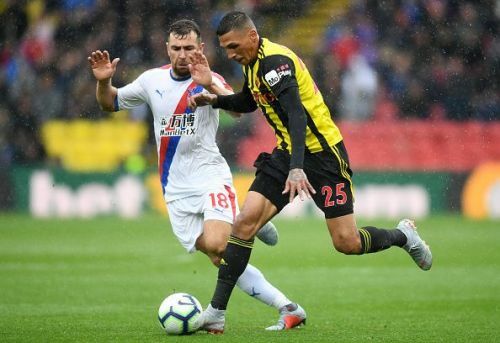 Jose Holebas has been fantastic this season, scoring one goal and providing four assists, but the Watford team has had contributions from everyone, and it will be unfair to the others if it is said that Holebas has been the lone bright star. This is a team full of much promise and potential. Jose Holebas – Watford's main man! They have kept two clean sheets so far and there would have been a third against Tottenham if not for an Abdoulaye Doucoure own goal. Pereyra and Deeney have been brilliant in front of goal, poaching and latching onto mistakes made and empty spaces provided by opposition defenders. Etienne Capoue has been good too, with Will Hughes not much far behind. The only concerns for Gracia will be Doucoure and Andre Gray who have been off-colour for a while. Craig Cathcart and Christian Cabesele have protected the team in the centre-back position and Dutchman Daryl Janmaat has made exciting runs at right wing-back. Gracia has impressed upon his team to defend deep and keep possession while the wing-backs make fresh runs every now and then to provide their wingers with excellent balls in the attacking third of the pitch. 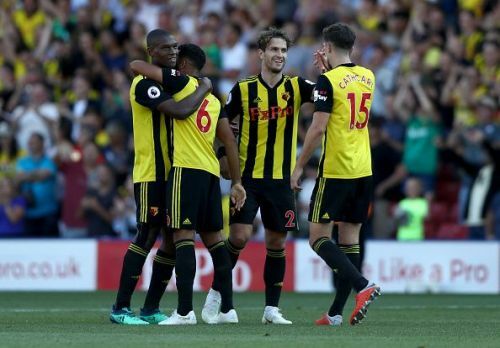 The match against Manchester United on Saturday provides Watford with an opportunity to show their supporters that the unbeaten run in the Premier League has been no flash in the pan and that they are here and mean business. They would want to let others in the Premier League know that they are indeed serious about what they want to achieve. They would want to start that by challenging a club as enormous as Manchester United. Watford will be taken to their absolute extremes by United who will arrive at Vicarage Road on the back of a good performance against Burnley away from home. Talisman Paul Pogba and forward Romelu Lukaku have been in fine touch. It will be a more than even competition. Watford need to declare their intentions of challenging for a spot in Europe next season and nothing will speak louder than a strong performance against Manchester United.